Modern homesteaders who want self sufficiency and cold milk or foods will want to look into spring house construction. A spring house is both effective and efficient as refrigeration for homesteaders without the cost of electricity or gas. The basics of how to build a spring house are similar to that of root cellars and earth domes where resources and construction material are found naturally in the local area. Locate the structure near a supply of fresh running water such as a stream or creek. The best location provides the ability to build the spring house into a hillside making earthen walls. If this is not possible, build the structure on level ground next to the running water. Avoid areas with lots of roots or rocks. You will be diverting water from the creek into the spring house and back to the original creek bed. Measure the depth of the creek at the center in several places. You need the average depth for the trench that will run through the spring house. Remember that water seeks its own level, therefore, maintaining the average depth of the creekbed for the trench will allow the water to flow easily through the structure and back out. Determine the length of the spring house. This will help you determine the diversion points for the water. You will be diverting the water a few feet ahead of, and after, the walls. There are two methods to building spring houses: build it into an existing hillside, or build a free-standing structure. The earthen method of building it into a hillside is more ecologically sound and uses much less material; the trade-off is construction time. A free-standing unit uses more material but takes less time. If you have the choice, determine best use for your needs. Excavate the hill to build an earthen spring house. Determine the width and height of the intended structure. Make the room at least 10-by-10-feet to provide space to move with the height at least 6-feet so an adult can safely stand up inside. You can make the height variable because the side with the trench can be shorter. The entrance will be on the opposite side to the trench. A freestanding building can be made from stone, brick, wood or block. Stone walls using slip form construction are the most efficient because they control costs with material already available around you. Brick and block are good alternatives if you have some mason skills. Wood should have foam or other insulation used to keep the temperature controlled. Understanding how to build a spring house means knowing the importance of getting the floor build right. Once you have decided on the walls, plan the exact spot for this structure to go. Dig a trench equal to at least a 10-foot square with the depth of at least 6-inches. The floor depth keeps the concrete from cracking due to ground contractions during the change of seasons. Check your local university extension office to determine your areas frost lines. Locate the diversion trench against the side of the structure closest to the creekbed. Dig out a 3-foot wide trench the depth of the creekbed. Dig the trench from either side of the spring house to where the trench will turn towards the creekbed. Do not break through the creekbed yet. Construct the framework for the floor from the 2-by-4 lumber. You will have two frames; a very large rectangle and a narrow rectangle. The wide rectangle will frame out the walkable floor space. The narrow rectangle will form the floor between the wall and the trench. You want the narrow frame at least the width of the wall because one wall will be resting on the concrete. Lay a 1-inch layer of gravel inside the frame. Rake it level. Pour in the concrete to fill the frame. Use a wood beam and a helper to level the floor and remove air bubbles. Move the beam back and forth while moving along the length of the floor. Allow the concrete 24 hours to cure. 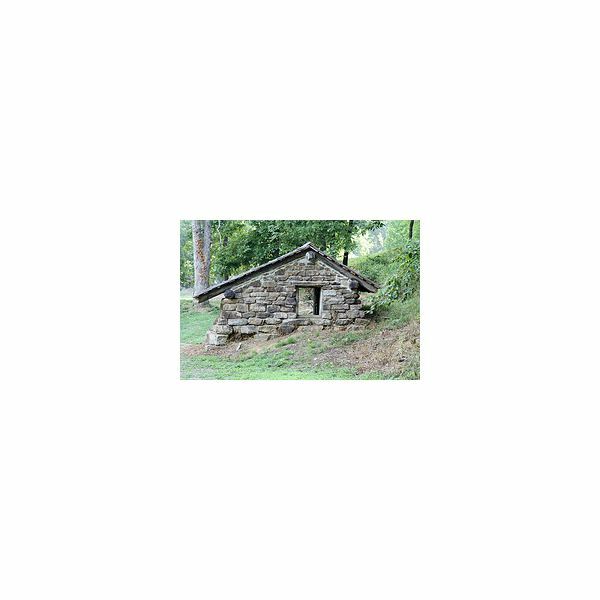 Determine if you will be using concrete, stone or wood for the trench inside the spring house. Each has pros and cons to work with. Stone lasts the longest, but requires some mason skills to build the walls. Wood is the easiest to use but will rot and have the shortest life. Concrete can be long lasting but requires framework and time to settle. Block off the trench with 2-by-4 lumber and construct the walls the length required for water to flow through the building. Use a good layer of gravel for the trench floor. This way the water will not pick up any contaminates from the soil. To get clean water from the creek through the spring house and return to the creek clean, you must build a covered trench the entire length. The spring house itself covers a good portion, but the inflow and egress are open trenches. Set the storm drain pipe in these trenches. Make sure you have enough pipe to extend from the original creekbed to the interior walls of the spring house extending under the walls into the trench. If you do not want to use elbows and joints within the pipe structure, dig the trench at an angle towards the creek. Break through the creekbed once you have the pipe as close as possible to the bed. Connect the last two sections of the pipe to extend into the creek at an angle that draws water into and then allows water to leave the pipe system. Check the water flow to ensure the pipes are holding and the water is flowing freely the entire length. Once you are satisfied,, cover the storm pipe with dirt. Bury the entire line from the creek to the spring house. This cover will keep contaminates out of the water. Add cinder blocks along the sides of the trench inside the spring house. Make the blocks half the height of the trench. You can place tall items in the center of the trench with smaller items sitting on the shelving along the sides. Build a rectangular wooden frame the width of the trench but half the height. The length is determined by your needs. Fit the frame into the trench to fit snug. Put items inside the frame so they are not washed away by the water flow. Set the door and the windows on the north facing wall to allow sunlight but prevent the room from heating up from direct sunlight later in the day. Use a tin roof to keep the heat out and for longevity.